Dé un paseo por la historia durante este recorrido a pie guiado por Madrid de longitud flexible. 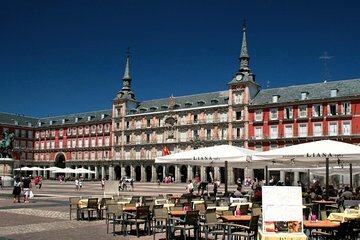 Pase por lugares emblemáticos de Madrid como la Plaza Mayor, el Palacio Real, la Plaza de Oriente y mucho más. También explorará algunos de los edificios más antiguos de la capital de España, como la Casa de la Villa (Ayuntamiento) y la Casa de Cisneros, que se remontan a la época medieval. Termine su viaje con una de las varias actividades opcionales, como una visita al Museo del Prado, una visita al Palacio Real, un espectáculo de flamenco tradicional y una cena de tapas. Un guía y recogida en el hotel (para los huéspedes de la mañana) también están incluidos. Explora la riqueza de la historia de Madrid durante este tour guiado a pie. Visite lugares emblemáticos de Madrid como la Plaza Mayor, el Palacio Real y la Plaza de Oriente. Gran manera de cubrir mucho terreno durante tu visita a Madrid. This was a great intro to Madrid. We were collected on time however there was an initial misunderstanding with our tour guide. She believed we were only doing the historical walking tour however I had also booked a skip the line guided tour of the Palace. It eventually got sorted so all good. Lots of walking involved but we covered a lot - visiting monuments and places of interest. The tour concluded at the royal palace. We met our second guide Elias who was absolutely sensational. For us this was the highlight of the tour. If you do nothing else in Madrid you must see the palace!! Highly recommend. Visited on 23 September. We had booked the Walking Tour, but because of organisational reasons we had to join a bus tour through Madrid. We felt very happy with this new tour as we saw a lot more places and got many advices what to explore later by feet. We were the only English speaking guests in the bus and Maria Gonzalo, the Spanish guide explained every detail in Spanish as well as in English. Thousands of compliments to her. The best was that because we had booked the Prado additional to the Walking Tour that was not included in the the bus tour we had a private tour by Maria Gonzalo, a marvellous experience, the best guided visit ever thanks to her! The Walking Tour through historical Madrid we made afterwards by our own with the help of Marias advices. Both tours we highly recommand, dont miss it! Not the guide's fault, but there were some problems with sorting out the clients on the pick-up bus for the various trips that day. My husband and I were the only ones on the walking tour, which was fine. Our guide gave us an overview of the historical sights. This was interesting. It was a good way to get familiar with the city since we were staying here for a few more days. Outstanding tour just the two of us with a young fully informed really pleasant guide.